The mobile app enables travelers to access the latest road conditions in real-time, including construction and traffic alerts, while remaining hands-free. A safety setting option also utilizes voice announcements for roadway updates while traveling. E-ZPass and Tolls by Mail information. 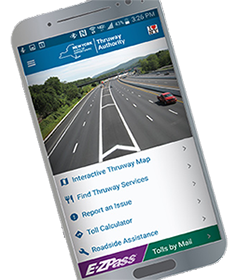 The app also provides links to the I Love NY tourism app, New York State Department of Transportation, New York Department of Motor Vehicles, New York State Department of Homeland Security and Emergency Services - See Something, Say Something, as well as the Thruway Authority website.